I spent a couple of days hiking around Melbourne, seeing and learning as much as I could about the city and its history. On the second day of my wandering, I found myself captivated by the National Gallery of Victoria. I go into some detail in my book about the history and development of painting in Australia, so I won’t go over all that here, but I did want to share more about the paintings that were my favorites—the works of the Australian Impressionists. This group was also known as the Heidelberg School, after a region where the painters loved to camp and paint the countryside and light that had so entranced them. These were the first artists to really capture Australia on canvas—the beauty, the hardships, the magical light, the openness, the strangeness, the wonder. Though many would follow, the four founders of this school were Frederick McCubbin, Tom Roberts, Arthur Streeton, and Charles Conder. 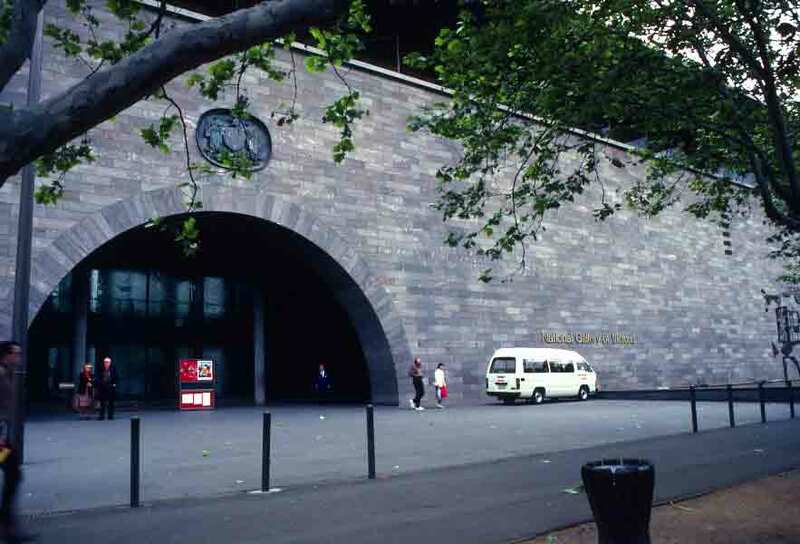 Their images have become iconic, reflecting the history, the life, and the reality of Australia. They may have been impressionists, but they captured their subjects more truly than those who had tried to use more traditional art styles. To avoid the legal issues involved in trying to pick up images that hang in museums or other private collections, I’m just going to give you links. There are a few articles, should you wish to read more, but there are also a lot of these men’s paintings, so you can get a taste of what their work was like. I left the gallery at the end of the day almost feeling as if I’d spent a day out bush. Australian Impressionism, overview with paintings. Paintings and where they were painted, from the National Gallery of Victoria. Melbourne is the most European of Australia’s cities. This is due as much to the sudden, stunning wealth generated by the Gold Rush in the 1800s as it is to Melbourne’s settlement history. Melbourne was settled by free men, not by convicts. It started as a village for cattlemen, and grew at a comfortable pace—until the discovery of gold. The population surged. The next big population explosion came at the beginning of the 20th century, when people from eastern and southern Europe were fleeing the devastation of war. As a result, Melbourne is rich in European-style cafés and great Italian restaurants, pastry shops reflect the traditions of Vienna, Warsaw, Prague, and Budapest, and the town is home to the third largest Greek-speaking community in the world, after Athens and Thessalonica. The older parts of Melbourne are elegant and charming. Architecture is often imposing and reflects both European sensibilities and the wealth created by the Gold Rush. Among the delights in Melbourne is its still-extensive fleet of trams, or streetcars—the oldest network of streetcars in the world. Hundreds of trams run over a couple of hundred miles of track, both through the city and out to the suburbs, making this an easy city to get around—and in an environmentally friendly way. The trams are a cultural icon here every bit as much as the cable cars are in San Francisco. 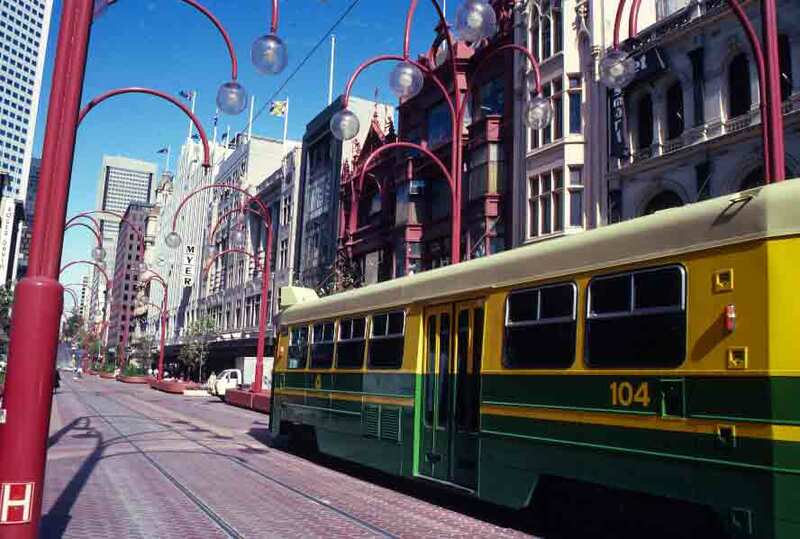 While no system of transportation is completely without flaws, Melbourne’s trams are remarkably reliable, affordable, and simply a fun way to get around town. The day after I returned to Adelaide from Kangaroo Island, I departed from South Australia. I would return later in this trip, and I have visited SA each time I’ve returned to Australia, but this first visit was at an end. A Greyhound bus carried me across the miles, and I had soon crossed into the state of Victoria, and by late afternoon, I was in Melbourne. The day after my arrival offered me a chance to visit offices necessary for arranging whatever sights I’d see in Melbourne, but the following day everything would be closed. I had arrived just in time for the Melbourne Cup. In my book, I quote one line from Mark Twain’s book Following the Equator (published elsewhere as More Tramps Abroad) about the Melbourne Cup, but I thought you might be interested in what else Twain had to say about the event. Mark Twain visited Australia in the late 1800s, while on a world-wide lecture tour. He was realistic and humorous in his appraisal, but also, on the whole, quite flattering. He said of Melbourne itself, “It is a stately city architecturally as well as in magnitude.” Twain also arrived at the time of the Melbourne Cup, and here are his observations (and I might add that little has changed since he wrote this). It is the “Melbourne Cup” that brings this multitude together. Their clothes have been ordered long ago, at unlimited cost, and without bounds as to beauty and magnificence, and have been kept in concealment until now, for unto this day are they consecrate. And so the grand-stands make a brilliant and wonderful spectacle, a delirium of color, a vision of beauty. The champagne flows, everybody is vivacious, excited, happy; everybody bets, and gloves and fortunes change hands right along, all the time. Day after day the races go on, and the fun and the excitement are kept at white heat; and when each day is done, the people dance all night so as to be fresh for the race in the morning. And at the end of the great week the swarms secure lodgings and transportation for next year, then flock away to their remote homes and count their gains and losses, and order next year’s Cup-clothes, and then lie down and sleep two weeks, and get up sorry to reflect that a whole year must be put in somehow or other before they can be wholly happy again. The Melbourne Cup is the Australasian National Day. It would be difficult to overstate its importance. It overshadows all other holidays and specialized days of whatever sort in that congeries of colonies. Overshadows them? I might almost say it blots them out. Each of them gets attention, but not everybody’s; each of them evokes interest, but not everybody’s; each of them rouses enthusiasm, but not everybody’s; in each case a part of the attention, interest, and enthusiasm is a matter of habit and custom, and another part of it is official and perfunctory. Cup Day, and Cup Day only, commands an attention, an interest, and an enthusiasm which are universal—and spontaneous, not perfunctory. Cup Day is supreme it has no rival. I can call to mind no specialized annual day, in any country, which can be named by that large name—Supreme. I can call to mind no specialized annual day, in any country, whose approach fires the whole land with a conflagration of conversation and preparation and anticipation and jubilation. No day save this one; but this one does it. As in Twain’s day, the crowds still throng. TV cameras reveal the fabulous clothes and ladies’ hats still purchased for the event. All businesses in Melbourne close for the day, and I have read that everything—work, traffic, conversation—in all of Australia stops for the few minutes of the actual Melbourne Cup race (because while there are races all day, only one is the actual Melbourne Cup). Fortunately, I got to enjoy this with a friend I’d made while touring elsewhere, along with her friends. So I was able to get swept up into the celebration of the race—though not with the expenditure on wardrobe. There is the usual range of jobs on Kangaroo Island that one would associate with a small town near a geologically significant tourist destination—workers in government, retail, hotels, and restaurants, park rangers, scientists. But the majority of the non-tourist income is from sheep ranching and seafaring—or, more specifically, fishing. I was too early for the crayfishing season (by three days! ), but I was delighted to dine on whiting that was only hours away from having been caught. Crayfish are what we in the U.S. would call rock lobsters—succulent crustaceans that thrive in these cooler southern waters. My experience of crayfish would wait for my visit to Tasmania, but because the season here was so close at hand, I did get to witness some of the preparations for the season. Tidy little cray boats lined the docks and shore, with fishermen busily outfitting them for work. I did think, given the roughness of the ocean at these latitudes, and the history of shipwrecks along this coast, that the boats seemed a bit dauntingly undersized. Cray pots were piled high on boat decks and on the docks. Though they were busy, the fishermen were also Australians (and small-town Aussies, to boot), which meant friendliness won out over bustle, and most stopped to say “g’day” and chat about the season ahead. 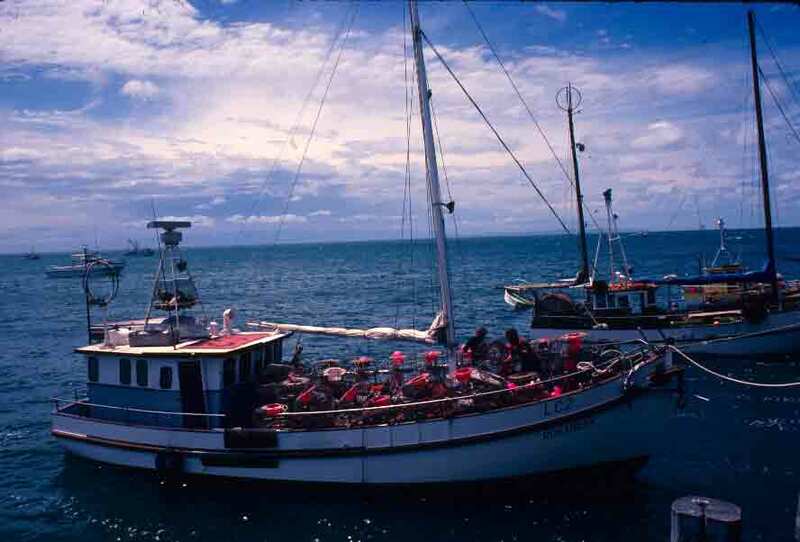 Below is a photo of a couple of the cray boats moored at the dock. So now, when you go to a restaurant that offers Australian rock lobster, you’ll be able to picture the dainty vessels that probably made these delicacies available to you.